Bank of America's second-quarter results should make long-term shareholders happy. Here's why. Bank of America (NYSE:BAC) reported second-quarter earnings that beat analysts' expectations on both the top and bottom lines, with impressive results across its business divisions. Profitability metrics have significantly improved, expenses are down, and capital levels are higher. As a Bank of America shareholder, I was pleased to see the following five things in the company's earnings report. Bank of America's capital levels showed strong improvement over the past year. The bank's Basel 3 fully phased-in common equity tier one (CET1) ratio improved from 10.3% to 11.4%, and the supplementary leverage ratio has improved as well. As a result, the bank passed the annual stress test and the Federal Reserve approved its capital plan, which allows the bank to increase its dividend and buy back more shares. Now, the 50% increase in its quarterly dividend to $0.075 per share is nice, but it's the buyback that shareholders should be really excited about. Bank of America received permission to repurchase up to $5 billion of its own stock over the next year, up from the $4 billion over five quarters that was approved a year ago. Why is this so much more important than the dividend raise? 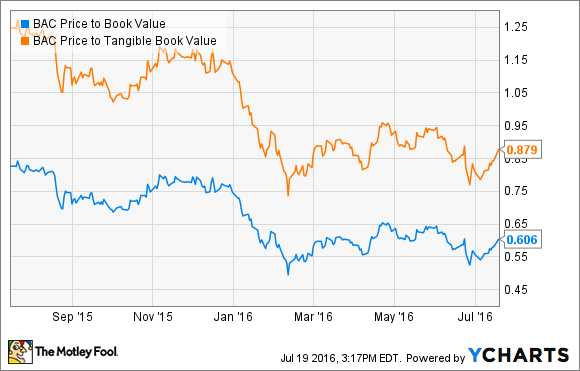 Simply put, Bank of America trades at a deep discount to the value of its assets. The bank's book value is $23.67 per share, and even when using the more conservative metric of tangible book value, the bank's assets are valued at $16.68 per share – well above the current $14.25 share price as of this writing. In other words, Bank of America can buy itself for a 15% discount, which translates to buying back almost $6 billion worth of its assets with the $5 billion authorized buyback, creating instant value for shareholders. Bank of America's non-interest expense of $13.5 billion is 3% less than it was a year ago and is the lowest since the fourth quarter of 2008. The bank has 6,000 fewer full-time equivalent employees than last year, which has led to increased efficiency. Source: Bank of America earnings presentation. In the consumer banking division alone, noninterest expense fell by $221 million which improved its efficiency ratio by four percentage points to 56%, a respectable figure. In fact, Bank of America's consumer banking division even beat rock-solid competitor Wells Fargo's (NYSE:WFC) second-quarter efficiency ratio of 58.1%. Bank of America's loan portfolio has grown by 2.5% over the past year. And it appears to be growing in the right way -- with high-quality loans. The bank's net charge-off ratio has dropped from 0.49% to 0.44% since this time last year, and the amount of non-performing loans has fallen by 24%, including a 5.2% improvement over the past quarter alone. For shareholders concerned about the bank's exposure to energy loans -- a legitimate worry -- it's important to note that utilized energy loan exposure dropped 6% from a year ago, including a 1% drop in exposure to higher-risk subsectors such as exploration and production. While I'd like to see a bigger reduction, any reduction is welcome news. Increased use of technology helps banks in a couple of ways. First, banks with the most user-friendly and functional online and mobile platforms have a competitive advantage when it comes to attracting and retaining customers. Not only that, but online and mobile banking can be a major factor in cutting expenses. According to a report by Accenture, it's up to 95% cheaper for a bank to process a deposit digitally than through a teller, and online and mobile payments cost 65% less than payment by a paper check. Bank of America has done a great job of encouraging its customers to embrace banking technology. Over the past year, the bank has grown its mobile user base from 17.6 million to 20.2 million customers, and mobile deposits now make up 17% of the total. Online banking and digital bill payments continue to grow, and the bank launched 2,800 cardless-enabled ATMs earlier this year. Bank of America was ranked No. 1 in both mobile banking functionality and digital sales functionality by Forrester, as well as number one in online banking functionality by Keynote, so it's safe to say that Bank of America is embracing the potential of banking technologies. While it's not quite as much of a steal as it was when it was trading in the $11 range earlier this year, Bank of America still represents a compelling value at its current price. This quarter showed great progress, and for investors willing to wait out low interest rates and for Bank of America's long-term plans to come to fruition, it could be an excellent time to buy.